The STROBE-Vet statement is a modification of the STROBE statement for use in reporting observational studies in animal populations. The original STROBE statement was developed to provide guidance for the reporting of observational studies related to human health. 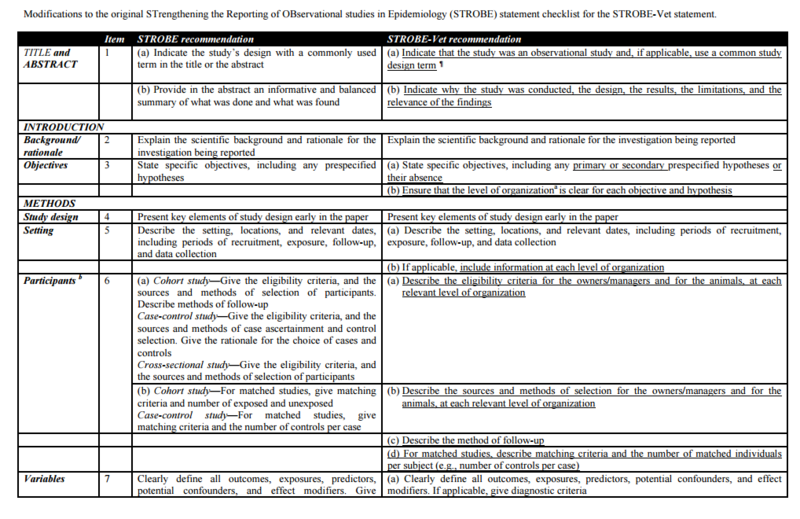 The STROBE guidelines focus on cohort, case-control, and cross-sectional studies related to human medicine and public health, although many of the principles also apply to other observational study designs. However, there are nuances of conducting and reporting studies in animal populations that are unique. Therefore, while the STROBE statement and the accompanying elaboration document provide an excellent resource for conducting, reporting, and reading observational studies, modifications to address specific issues in veterinary medicine will increase its applicability. Therefore, the STROBE-Vet statement was created as a modification of the STROBE statement to address issues in animal populations. The scope of the STROBE-Vet statement includes observational studies using samples/information of animal origin with outcomes related to animal health, production, welfare, or food safety. Thus, STROBE-Vet encompasses a broad range of veterinary research involving animals (including animal populations such as herds, farms, or flocks), products of animal origin (such as meat or milk), or samples from animals (such as blood or feces). From a study design perspective, the scope of STROBE-Vet includes both observational studies of hypotheses (hypothesis-driven or hypothesis generating) and population-based descriptive studies, such as those estimating the frequency and distribution of disease. Want an easier way to fill out the STROBE-Vet checklist? Try our new tool now! Sargeant, J. M., O'Connor, A. M., Dohoo, I. R., Erb, H. N., Cevallos, M., Egger, M., Ersbøll, A.K., Martin, S.W., Nielsen, L.R., Pearl, D.L., & Pfeiffer, D. U. (2016). Methods and Processes of Developing the Strengthening the Reporting of Observational Studies in Epidemiology–Veterinary (STROBE‐Vet) Statement. Explanation and Elaboration Document for the STROBE-Vet statement: Strengthening the Reporting of Observational Studies in Epidemiology – Veterinary extension. O’Connor AM, Sargeant JM, Dohoo IR, Erb HN, Cevallos M, Egger M, Ersboll AK, Martin SW, Neilsen LR, Pearl DL, Pfeiffer DU, Sanchez J, Torrence ME, Vigre H, Waldner C, Ward MP. Zoonoses and Public Health. 2016. 63: 662 – 698.